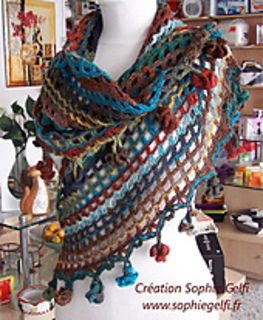 This very easy crochet shawl pattern is accessible to beginners. You can stop at any time if you don’t if want to make the fancy edge, or replace it by any border of your choice. Pattern includes clear diagram and step by step photos. variegated or hand dyed yarns will give the best results. 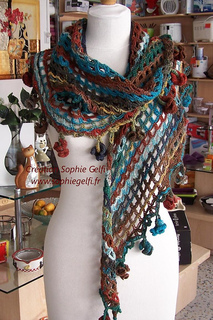 I made this one with a sock yarn from a famous japanese brand. 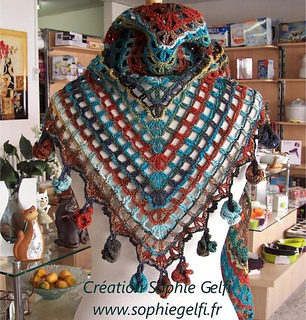 Feel free to ask if you have any questions about it and have a look at my other crochet patterns. Le modèle est disponible en français, je vous l’envoie en format doc directement par mail après avoir reçu la notification d’achat de ravelry.